Proviable Kits contain a source of live (viable) probiotic microorganisms. Proviable contains multiple species with billions of beneficial microorganisms per daily administration. Proviable-KP paste contains probiotics, prebiotics, and ingredients to help firm stools. Proviable-DC capsules continue to help support healthy intestinal balance. Added prebiotics, found in both formulations, encourage growth of the Proviable beneficial microorganisms within the intestinal tract. Store at room temperature not to exceed 77º F and out of direct sunlight. Proviable-KP paste contains probiotics, prebiotics and ingredients to help firm stools. Tasty paste is easily administered. Give capsules and paste by mouth as directed by your veterinarian. Paste and capsules should be started on the same day. INGREDIENTS CAPSULE: Fructooligosaccharide, gum arabic, gelatin, maltodextrin, dried Enterococcus faecium fermentation product, dried Bifidobacterium bifidum fermentation product, dried Enterococcus thermophilus fermentation product, dried Lactobacillus acidophilus fermentation product, dried Lactobacillus bulgaricus fermentation product, dried Lactobacillus casei fermentation product, dried Lactobacillus plantarum fermentation product, magnesium stearate, titanium dioxide, and ascorbic acid. INGREDIENTS PASTE: Soybean oil, kaolin, fructooligosaccharide, gum arabic, pectin, dextrose, sucrose, silicon dioxide, maltodextrin, dried Enterococcus faecium fermentation product, dried Bifidobacterium bifidum fermentation product, dried Enterococcus thermophilus fermentation product, dried Lactobacillus acidophilus fermentation product, dried Lactobacillus bulgaricus fermentation product, dried Lactobacillus casei fermentation product, dried Lactobacillus plantarum fermentation product, artificial beef flavor, and ascorbic acid. *CFU - colony forming unit. Proviable should not be given at the same time as antibiotic medications for full effectiveness of the probiotics; therefore, it is best to separate administration by 1-2 hours. The kaolin and pectin in KP paste could delay absorption of some medications, so the use of the paste should be separated by 1-2 hours. Original capsule formula, Proviable-DC, contains a source of live (viable) probiotic microorganisms in multiple species with billions of beneficial microorganisms per daily administration. Proviable-DC capsules help support healthy intestinal balance. Added prebiotics help encourage growth of the Proviable beneficial microorganisms within the intestinal tract. May be given short-term to help support intestinal balance or used for long-term intestinal health. Dogs and cats of all sizes: Give 1 sprinkle capsule by mouth daily as directed by your veterinarian. Capsules are individually foil packed. 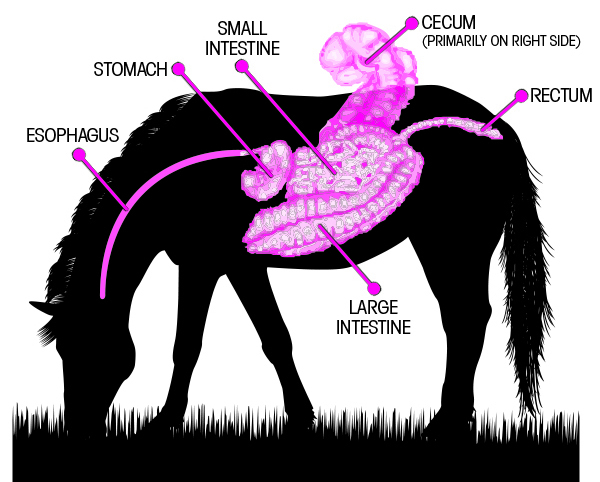 Unlike people and dogs, horses have a diet composed primarily of forage (grass and hay) and have a cecum in the hindgut for the fermentation of these forages. For this reason, a horse is referred to as a hindgut fermenter. The cecum is a large tube-like structure at the junction of the small and large intestine that holds large particles of forage material for fermentation and digestion. Fermentation is the process by which the good anaerobic (without oxygen) bacteria break down plant cell walls and carbohydrates to provide absorbable vitamins and energy sources to the horse. Horses cannot break down these plant cells without the presence and maintenance of the good bacteria in the hindgut and the functional environment for the support of fermentation. Why does Proviable®–EQ use yeast? Proviable®–EQ uses yeast because they are more supportive in the anaerobic (without oxygen) environment of the hindgut during fermentation, as opposed to aerobic (oxygen requiring) bacteria used in many other products that support the foregut but may not survive in the hindgut. The Saccharomyces species of yeast used in Proviable®–EQ are able to support the fermentation process where the majority of fiber and carbohydrate digestion and absorption occurs. Proviable®-EQ is a synbiotic (probiotics plus prebiotics) product designed to help reestablish and maintain intestinal health. Keeping your horse’s hindgut healthy can be a challenge when so many factors contribute to imbalances in the hindgut's microfloral population such as travel, competition, change in diet and using antibiotics for a long period of time. The Saccharomyces yeast species encourage normal gastrointestinal function and health. Proviable®-EQ can be used continuously or as needed to help maintain hindgut health during times of stress or digestive upset. Are other brands of probiotic products equivalent to Proviable®-EQ? Proviable®-EQ contains billions of live probiotic microorganisms and is quality tested to meet label claim (contains the number of colony forming units, or CFUs, listed on the label). Some products may not contain live probiotic microorganisms or may not contain sufficient numbers of the microorganisms to support intestinal health. Proviable®-EQ contains Saccharomyces yeast species as opposed to the aerobic (oxygen requiring) bacteria used in many other products. Yeast are able to survive in the anaerobic environment (without oxygen) of the horse's hindgut, where the majority of digestion occurs, to support digestive health. Bacteria-based products cannot survive in this environment and, therefore, can not support digestion occurring there. The paste contains two species of Saccharomyces yeast (Saccharomyces cerevisiae andSaccharomyces cerevisiae var. boulardii) that help to restore a balance of the good bacteria in the intestine after acute digestive upset. The paste can also be used long term, intermittently, or daily to support the good bacteria in the intestines. Give 5 mL by mouth once daily for 6 days, or as needed, to help protect against microfloral imbalances. To help reestablish healthy intestinal balance, give contents of 1 tube 3 times daily for up to 72 hours. To order, contact your authorized PROVIABLE distributor, or call Nutramax Laboratories Veterinary Sciences, Inc. at: 888-886-6442.